The cliché, goals change games, is a phrase usually found near the top of any list of football idioms you stumble across. A common extension to that expression reads “goals change games whenever they are scored”, but at what stage of the game are those goals most likely to arrive? One of the most underutilized markets in the football betting arena are the “half with the most goals” or “highest scoring half” selections offered by bookmakers. Statistically, more goals are more likely to be scored in the second half of matches in England’s top four divisions and generally, the bookies odds reflect that. The data shows that on average 43.125% of the total goals scored across England’s top four leagues (Premier League, Championship, League One and League Two) so far this season arrived in the first half. Bookies therefore offer much more favourable odds on the opening 45-minute periods of individual fixtures having more goals than the second. However, routinely you will still find odds of evens or better on the second half of a particular match having more goals than the first. To help you attack this potentially lucrative market as a more informed bettor, we’ve dived head first into the statistics to pull up some interesting numbers for you to digest. 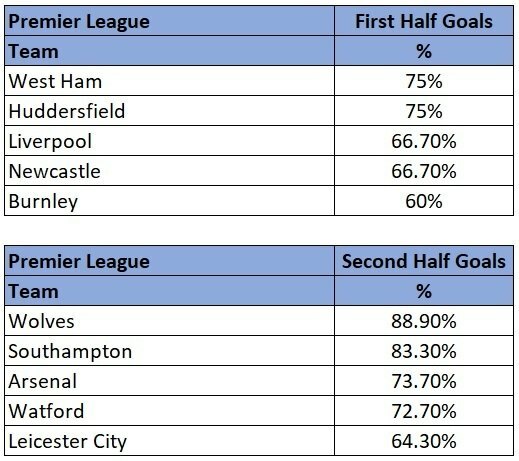 6 of West Ham’s 8 Premier League goals this season were scored in the first half of their games, while 4 of Huddersfield Town’s 6 goals to date also arrived before the half time whistle. Interestingly, a little over two thirds of Liverpool’s league goals were scored in the first half, which suggests Jurgen Klopp’s men tend to fade in the second half of games. They certainly looked far leggier at the weekend in the second 45 against Manchester City at Anfield. Liverpool travel to take on Huddersfield Town at the John Smith’s Stadium on October 20th in the first round of Premier League fixtures after the international break. You can get odds of around 2/1 for the first half of that clash to have more goals than the second. 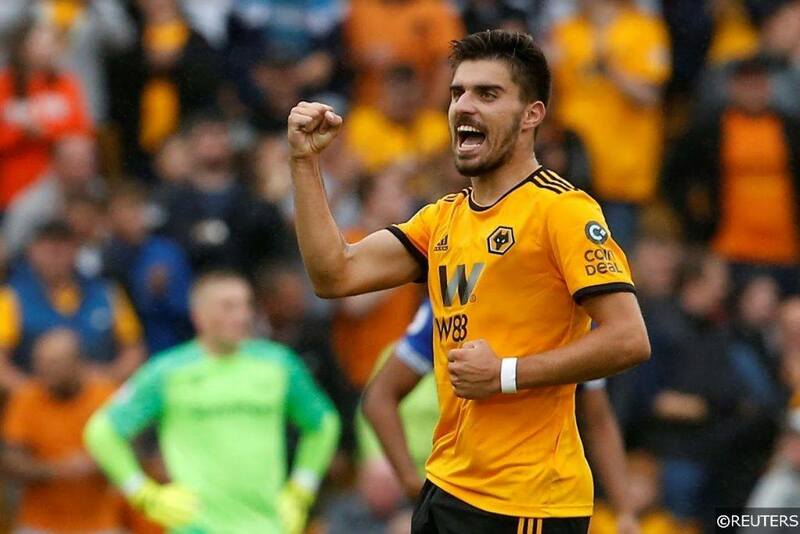 Remarkably, Wolves have scored 88.9% of their Premier League goals in the second half of their fixtures so far in 2018/19. They take on Watford, who have netted 72.7% of their total goals in the second period, again on October 20th. You can find odds of 21/20 for the second period in that contest to be more action packed. Arsenal, who have scored 73.7% of their goals after half time host Leicester City at the Emirates 2 days later on October 22nd. 64.3% of the Foxes’ league goals were scored in the second period this season. QPR are the joint lowest scorers in the Championship so far in 2018/19, having found the net just 9 times in their first 12 fixtures. 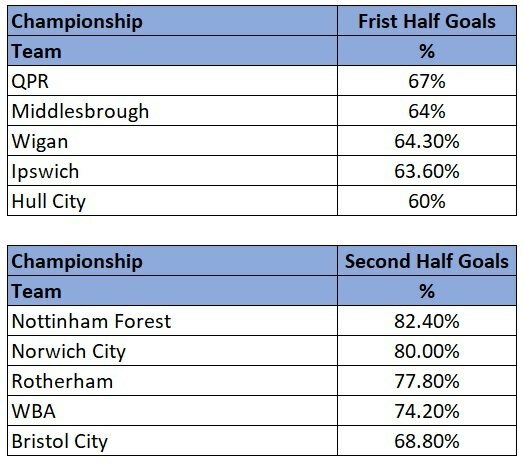 67% of those 9 goals were scored in the first half of the Hoops’ games. On October 20th, when the domestic programme resumes, QPR play Ipswich Town at Portman Road. The Tractor Boys have scored 63.6% of their goals before the interval this season. Currently you can get odds of around 11/5 for the first half of that clash to have more goals than the second. Incredibly, 14 of the 17 league goals Nottingham Forest have scored this season were struck in the second half of their games. Similarly, 12 of Norwich City’s 15 Championship goals so far were plundered in the second period of their fixtures. As luck would have it, Forest and Norwich City lock horns on October 20th too……that worked out nicely (and eerily). You can get 21/20 on the second half of that one to be the highest scoring period. In League One, 10th placed Fleetwood Town rank top of the pile for goals scored in the first half. 14 of the Cod Army’s 19 goals were scored inside the first 45 minutes of their games. 2nd from bottom Plymouth Argyle, who are the division’s joint lowest scorers, netted 6 of the 9 goals they have registered so far this season in the first half of their matches. 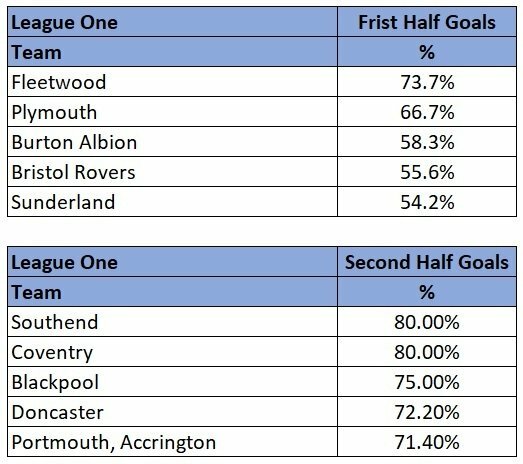 Southend United and Coventry City are the second half scoring experts in League One, netting 80% of their total goals after the break in their respective fixtures. Southend and Coventry come face to face on October 20th at Roots Hall. 15 of table topping Portsmouth’s 21 goals were also scored after the interval. Interestingly, Pompey play League Two’s Crawley Town in the EFL Trophy this week. 76.5% of Crawley’s league goals arrived in the second half of their games this season too. You can get evens on the second half of that clash outscoring the first. Struggling Grimsby Town are languishing in 19th place in League Two. The Mariners have only scored 9 times in 12 league fixtures in 2018/19, the joint lowest total in the division. Town aren’t exactly prolific, but when they do cut loose, they do most of their damage in the first half of their games. 7 of their 9 goals were scored before the half time whistle, in fact Jonathan Hooper’s 53rd minute goal for Grimsby against Port Vale on Saturday was the first time the Mariners had scored in the second half of a game since the 4th of September. 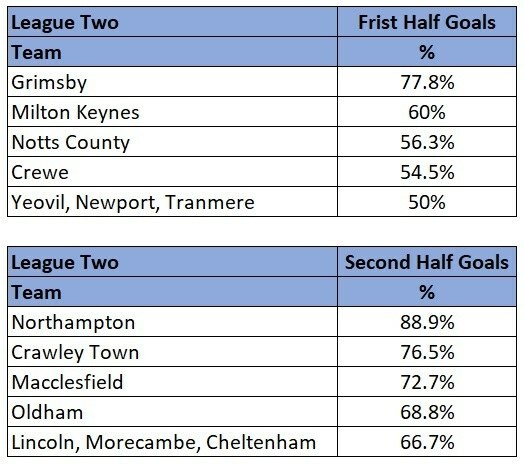 In contrast, 3rd from bottom Northampton Town, who are one of the teams locked on 9 goals with Grimsby, have scored 88.9% (8) of those goals in the second half of their games. Their solitary first half league goal this season was scored back on the 11th of August by Kevin van Veen in Town’s 2-2 draw at Carlisle. Categories: Blog, Football, and Premier League. Tags: betting advice, betting tips, championship, football betting guide, football tips, half with most goals, League One, league two, and Premier League. League: England Championship, England League 1, England League 2, and England Premier League. Sports: Football.